When will SlideDog support file type X and program Y? Currently SlideDog supports a limited number of presentation formats and file viewers. We are continuously working to support more file types. If you miss a format that you think we should support, please contact us. When deciding which file viewers to support and what software SlideDog will use to show a specific media format we mainly focus on choosing the file player that has the broadest range of file type support. Other important factors are responsiveness and trustworthiness. For example Adobe Reader might not be the fastest or smallest (in file size) PDF viewer out there, but it is king when it comes to supporting the different kinds of PDF files, including support for multimedia and 3D in PDF files. However, we understand that people have strong preferences in the programs they use (for instance their default browser) and therefore we are working on broadening the support for viewers of specific file formats. Will SlideDog work without an internet connection? SlideDog works completely offline as long as you do not add online content to your playlists such as web pages, YouTube videos and audience interaction elements (Feedback, Poll, Chat). The Live Sharing feature and the SlideDog iOS/Android app will not work without an internet connection. How do I install or uninstall SlideDog on Windows? 1. Download the SlideDog web installer or the offline installer of SlideDog. 2. Start the installer. If Windows warns you about the file being downloaded from the internet, click “Run anyway”. 3. Click “I Agree” if you agree to the license agreement. 4. Follow the on screen instructions. The installer will try to download and install Microsoft Visual C++ 2015 Redistributable (x86) runtime and .NET 4.6 Framework if your machine is missing these framework dependencies. 5. SlideDog is now either installed in your local app-data folder or in your “Program Files (x86)” folder, depending on your choice of installing per user or per machine. You can start SlideDog by clicking the shortcut on your desktop or from the Start Menu group “SlideDog”. To uninstall SlideDog, first navigate to “Control Panel” > “Programs” > “Program and Features”. Then search for “SlideDog”, select “SlideDog” and click on “Uninstall”. SlideDog will be completely removed from your computer. What screen resolutions (on primary and secondary screen) do SlideDog support? SlideDog supports all screen resolutions that are available on your operating system. 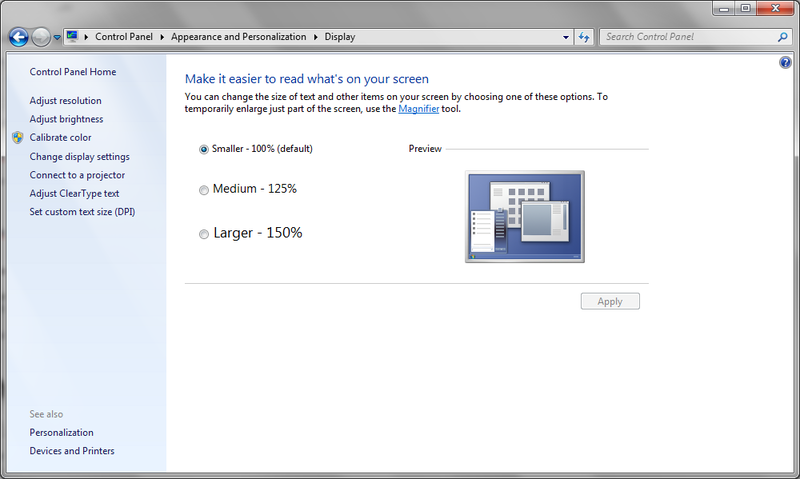 SlideDog does not consume significantly more resources when running presentations in high resolutions and should run fine on a resolution of 1920×1080 on the secondary screen when running SlideDog Pro. Go ahead and create presentations in HD! Is there an offline installer of SlideDog available? We offer an Offline Installer of SlideDog that you can use to install SlideDog without being connected to the Internet. What are the system requirements for SlideDog? Do you have a community forum for SlideDog users? Our forum is open for everyone to register and post their questions. There are some areas that are restricted to Pro users and beta testers only, but most of the discussion happens out in the open. Please join us at https://forum.slidedog.com ! Will my animations / transitions / videos / fonts / etc. display correctly in SlideDog? Since the task of showing the presentation files is entirely up to the software viewers installed on your PC, the result will be the same with or without SlideDog. But on a general note, presentation files may not always act and look the same on different platforms and versions of presentation software. For example, a .pptx file made with special effects only available in PowerPoint 2016 will not look the same when viewed in PowerPoint 2013. You should always check your presentation files in advance on the computer you intend to use for your live presentation. What file types, presentation formats and viewers does SlideDog support? To add Prezi files to the SlideDog playlist you first need to download an offline/portable version (comes in a .zip file) of your Prezi from your account at the prezi.com website. Then you need to extract the contents of that zip file. Among the extracted contents you will find an “.exe”-file. This is the file that you should add to your SlideDog playlist. Important: If you’ve downloaded the offline Prezi more than 12 months ago, you need to re-download it from prezi.com. Also, before starting a Prezi in SlideDog, you should close all open Prezi windows. What software do I need to run SlideDog? SlideDog runs best on Windows 7 and later. If you are using Windows 7 or Windows 8 and plan on using the two-screen mode in SlideDog, you should enable “Aero”: How to enable Aero on Windows 7. Why do I need third-party software to run SlideDog? To show your presentation files as accurate as possible, SlideDog uses the best file viewer programs available for the various file formats (PowerPoint is used to show .pptx files, VLC is used to show videos, etc.). We could have made SlideDog to not rely on third-party software, but then we’d have to resort to conversion of all the presentation files into a standardized format. This process almost always leads to loss of quality. Transitions will sometimes be lost, animations won’t show up correctly and fonts may appear less crisp. It’s no requirement to have Office PowerPoint, Adobe Reader or Google Chrome installed, but you won’t be able to display the file types (.pptx, .pdf and web pages) of those programs through SlideDog if you don’t. You can however still show videos, images and use the audience interaction features. Can I split a PowerPoint or PDF in SlideDog and insert videos in between? Not without manually splitting the .pptx or .pdf into two separate files. SlideDog will however remember the last slide/page you were on when switching from a PowerPoint or a PDF to another item during your presentation. The SlideDog presenter remote feature it makes it really easy to jump between different files and media without splitting them up. Can I select the start and end time of a video file in a SlideDog playlist? Not without manually editing the video file. What happens if I add the same file twice or more in playlist? They will be treated as separate files. If you advance on one playlist item, the other won’t be affected. Is it possible to automatically advance / loop through the playlist? Yes, but this is a Pro feature. Free users can try this feature for 15 minutes from within the app. If you go to the “Settings” and “Preferences” menu, you can check “Advance Automatically” under the “General Settings” tab. SlideDog will then advance to the next slide or file automatically (will jump to the next file if at the last slide of a slide deck). Videos will be played until the end before jumping to the next item in the playlist. To enable looping of the playlist, tick the box next to “Loop Continuously”. SlideDog will now jump back to the first file after completing the last file in the playlist. All files will be re-set and play from the first slide/page/frame. Can I use my phone to control SlideDog? Our SlideDog companion app for iOS and Android allows you to remote control SlideDog. You can also control your PC running SlideDog directly from https://live.slidedog.com, if you can’t or don’t want to to download an app. The web version offers much of the same functionality as the iOS and Android apps. Make sure to enable the Remote feature in the SlideDog application by clicking the mobile phone toggle button in the top-right corner of the SlideDog PC application. What are the keyboard shortcuts in SlideDog? SlideDog only has a few keyboard shortcuts. In general you press “PgDn” or “Right Arrow” to go to the next slide or item in the playlist and “ESC” to unload the presentation files and exit the show. Remember that you can still use the file viewers keyboard shortcuts when you are playing the files in SlideDog. For instance, PowerPoints keyboard shortcuts will also work in SlideDog. Can I control SlideDog with a Wireless Remote? You can use most standard presenter remotes, such as the Logitech Wireless Presenter. Wireless remotes usually work by simulating the PageUp and PageDown keys on your PC, which is the next and previous slide trigger keys for PowerPoint and also for SlideDog. So, as long as your remote works with PowerPoint, Adobe Reader, etc. it should work with SlideDog. How can I use Prezi in SlideDog? It’s possible by downloading your Prezi (Next) presentation to a “Standalone / Offline file”. Note: Downloading a Prezi presentation is not available when using Prezi Next online. Please use the Prezi Next desktop application to download your presentation. Download the offline portable version of your Prezi presentation and unzip it to a folder on your hard drive. Open the folder where you unzipped your Prezi presentation. Drag the “.exe” file into the SlideDog playlist. Close any open windows of offline Prezis (if you skip this step, SlideDog won’t be able to load the Prezis). Click “Start Show” and wait for the files to load (some Prezis takes a long time to load). Important: Make sure you’ve closed all open windows of offline Prezis before trying to start a show in SlideDog that contains Prezi files. Is it possible to purchase one license of Pro and use that single license on my work PC and my personal PC? One SlideDog license is valid for one computer. However, you can deactivate your license from the “License” top menu and then reactivate it on another PC. Yes we do. When you buy two or more copies of SlideDog, you are eligible to receive volume pricing. We cannot do business outside of the country. Does your company have an office in USA? Please contact us for additional questions related to payment. I need an invoice, where can I request it? If you purchased SlideDog via our own store, you will have received an invoice to the email you entered when purchasing. Search your inbox for “Your Order: SlideDog” (with quotes) and you should find one or more emails with your order ID(s), starting with the letters “PRE” followed by three sets of numbers separated by dashes (example: PRE111111-2222-33333). The emails will contain a link to your invoice for your initial SlideDog purchase or re-bill. If you still can’t find your invoice please contact us. The Order ID from the purchase you would like to have refunded. This is a code starting with “PRE” that you’ll find at the top of your invoice. The last four figures of the Credit Card you used for purchasing. If you didn’t use CC or if you used PayPal, please let us know the date of the purchase. After we have received this information, a member of our customer support staff will be able to help you. Once your refund is issued it can take between 3-10 working days (depending on the payment method you used at checkout) for the refund to be credited to your account. Don’t forget, you can try a fully-featured version of SlideDog before you buy by enabling the Pro trial inside SlideDog. Download SlideDog here to see if SlideDog is right for you — no credit card required. Please note: SlideDog’s refund policy exists to help customers who no longer wish to use the app due to compatibility issues or unsuitability — not as a way to use SlideDog for free. If it appears to us that you are abusing refunds, we reserve the right to stop offering them to you at any time. Can I transfer my SlideDog Pro licence from one PC to another? SlideDog is now reverted to the free version and you can activate your license on another computer. To cancel your subscription of SlideDog you must click the link contained in the email you received when you first made your order. This link is also found in each of the renewal notification emails. If you’re still having trouble unsubscribing, please contact us. Where do I enter my SlideDog Pro license key? You’ll need to be connected to the Internet when activating your license key. How do I order the Pro version of SlideDog? You can order a Pro license by visiting the SlideDog store. Your payment will be processed immediately and you’ll receive your license key by e-mail within a couple of minutes. Start SlideDog and activate the license from within the application. How do I enable Presenter View (two screen / extended desktop mode) in SlideDog? Enable “Extended Desktop” mode by first pressing and holding the Windows button on your keyboard, then press the “P”-key. Select “Extend desktop”. SlideDog will detect your secondary screen and automatically set itself to two-screen mode if you have SlideDog Pro activated on your machine. The SlideDog Live Sharing feature doesn’t work on my computer! 2. Anti-virus or Firewall software might be blocking some of the components needed to run LiveSharing. Please try to disable any anti-virus software while running SlideDog and see if this helps. 3. You are connected to the Internet through a VPN connection. This might limit the connection to our servers, and also make it harder to detect your physical location so we can connect you to the closest server possible. Please try to connect to the Internet without using VPN. If none of the above helps, let us know and we can diagnose further. Please bear in mind that if you use a corporate computer, there might be system restrictions put in place by your administrator that prevents our software from functioning properly. When you purchase the SlideDog Pro annual subscription for the first time, you can use it for a year from the date of purchase, or for as long as you keep your subscription active. If you choose to cancel your subscription, SlideDog will automatically revert from “Pro” to “Free” on the expiry date of your license. Customers who purchased a SlideDog Pro Forever license earlier than 2017.01.01 were guaranteed updates until version 2.0.0. Customers who purchased the Forever license on 2017.01.01 or later are guaranteed updates until version 3.0.0. Uninstall SlideDog from your computer if you are running a different version than 1.9.18. Disconnect your Wi-Fi or Internet connection, or put your computer in Flight Mode. While disconnected from the Internet, run SlideDog and go to “Settings” – “Preferences” – “General Settings” from the top menu. Turn off “Enable automatic updates”. Close SlideDog and re-connect your Wi-Fi or Internet connection / turn off Flight Mode. Restart SlideDog and enter your license code in the “License” – “Upgrade to Pro” top menu item. 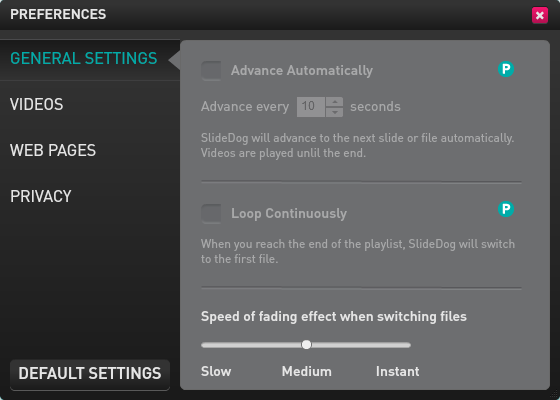 SlideDog Pro will now keep functioning as before, but without downloading version 2.0.0 and above. You can read the Slidedog End User License Agreement here, which is a legal contract between a software application author or publisher and the user of that application. You can read our privacy statement here. It informs you about the type of personal data that is collected and received through our website (https://www.slidedog.com), the Windows application “SlideDog” and our cloud and app-based services that relate to SlideDog (https://live.slidedog.com and the Slidedog iOS/Android app).